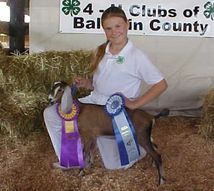 When we acquired our first dairy goats, i promised the children they would never have to sell their first goats. We were incredibly lucky to have very nice foundation does, so it has been an easy promise to honor. Under normal circumstances, the old does are bred each year as long as they are doing well and holding weight. Sadly, once they stop cycling each year they do not seem to last long. Contrary to the belief that old, dry does get the short end of the stick, we have found that ours still rule the roost. Penny insisted on being in charge of the 'big doe pen' after the loss of Babe a couple of years ago- she refused to act her age! As our original does age, we have been noticing some interesting things about the lines we have used. Merry cycled the month before she died at 14 (we refused to let her be bred any more since she didn't hold weight as well). Sadly we are finding that many of the lines are not staying fertile for that long...of course, most people don't want to keep and breed does over 10 years of age! Mostly though, our old does are holding up really well, we are just choosing to focus our breeding on younger does. Ramona is incredibly elegant and gorgeous in motion, and she passes on that elegance to her offspring. She has a well attached, globular mammary, and is a pleasure to hand milk. 2013 Ramona daughter, TARDIS, as a first freshening yearling. Maybellene is elegant, long-bodied and very smoothly blended with very strong feet and legs and good spring of rib. She freshens each year with a consistently nice udder and plenty of milk. Maybellene went grand and BJDIS at her first show as an 8 week-old kid. 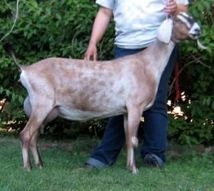 She did very well in tough California competition as a young doe, usually placing in the top of her class. Maybellene kidded in 2015 with lovely twin does sired by Tecosa Play It Forward. She is now retired and both doe kids will be retained. Penny has outstanding width, a very long body, a very high & wide escutcheon and a very well attached mammary. 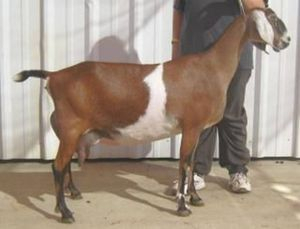 She is a barn favorite, being stylish, clean & strong while maintaining dairy character. Since her fore udder is strongly attached, but short, we always breed her to bucks we believe will improve fore extension. Picture on right is first freshening rear udder, the left is as a mature doe. 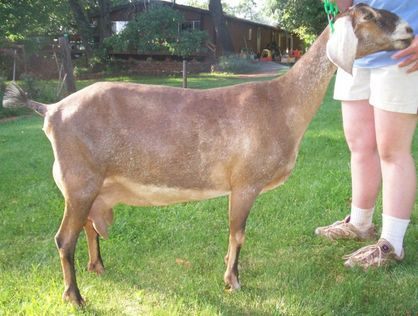 Constance is a wide, long, deep-bodied doe. She is big, too, and so are her kids. She is very eye catching and moves with presence. We would like to see stronger rear feet and smaller teats, but her strength of topline, extremely correct shoulders, width and breed character make up for these deficiencies. She is a very steady doe, with a level lactation. The best word to describe Shangdu is HUGE. 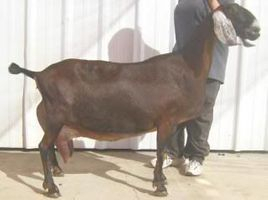 She is a powerhouse doe with a very nice udder, extremely high into the escutcheon and very well attached. She also excels in dairy strength and when in prime production is our best milker. Unfortunately we were not on DHIR in 2010 when she peaked at 16 lbs a day and held steady at 14 lbs for months! 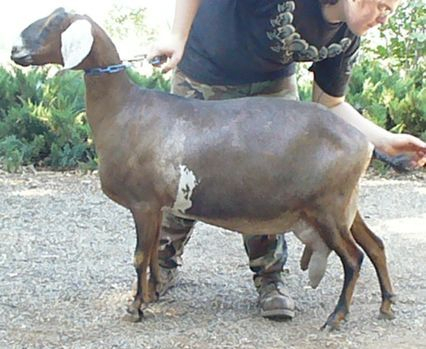 She did have a very respectable lactation while on lease to Wilkins Family Nubians in Ada, OK. We would love to see smaller teats on this doe, and our breedings choices for her reflect this, as well as our desire to see a stronger top line. Delia excels in width and strength over the top line. Her mammary is extremely well attached, and one judge described her fore udder as "flawless". She has matured into a doe with incredible depth of body and width. Unfortunately she was rather stale at appraisal in 2015 and performed below our expectations. Delia has been retired and will be moved to reference animals soon.